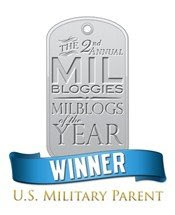 Back in late 2004 when I began to toy with the idea of keeping a web log on my experiences as a mother with a son at war, I can’t say that I had ever even heard the term “milblog” or even its extended “military blog”. Since December 2004, I have been privileged to become a part of the world of milblogs and a member of the milblog community. Other milbloggers and those that read their work have been my supporters, my cheerleaders and my friends. I have been thrilled to meet a few… and now I hope to meet many more at The 2006 Milblog Conference (the brainchild and hard work of Andi at Andi’s World). I'll be serving on the "Milblogging Family Style" panel! The milblog community is diverse, and we intend to showcase the full spectrum of milblogs, including those who have blogged from theater, veteran members of the armed forces, spouses and parents. Due to seating limitations only 300 seats can be guaranteed. Non-milbloggers and non-bloggers are welcome to attend the conference, but because this conference is for milbloggers, milbloggers will be allowed to pre-register: 150 seats are reserved for milbloggers who wish to attend. Any unclaimed milblog seats will be released to non-milbloggers and the public. Registration for this event is free of charge. Pre-registration will begin on February 8 and continue through midnight February 15. Any slots not filled by milbloggers will be given to the general public. Registration for the public will begin on February 16. All registrations are first-come, first-serve. I am already excited. Just waiting to register on Wednesday, before I make my reservations. If I'm still in the area I'd love to buy you dinner that weekend, or at least a drink. Bob - buy me a drink too. I can't wait to meet you! 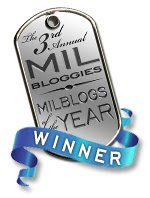 Can you believe we now use the term milblog in our daily lives? I can't believe you weren't on my blogroll - well you are now!